Mohegan Sun Arena had their second highest turn out on Saturday night as the New England Black Wolves (8-7) hosted the San Diego Seals (9-6). The 6,046 fans watched the home team punch their ticket to the post season for the fourth straight season. The Black Wolves jumped out to an early lead and lasted through a furious fourth quarter come back to finalize the field of four teams going to the post season in the East Division. The Seals were playing on the second night of a back-to-back and were without rookie phenom Austin Staats and veteran Kyle Buchanan for the game. 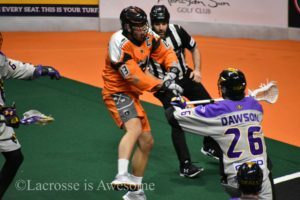 The Black Wolves scratched Tyler Digby for the first time this season, and rookie Dereck Downs for the second straight game. The lineup changes worked in favor of New England as they never trailed in the game. Final Score: San Diego-14, New England-17. New England jumped out to a quick lead. Just 1:44 in, Joe Resetarits (2G, 5A) fired a shot from outside that beat Seals’ net minder Frank Scigliano. Four minutes later, Brandon Clelland (1G) tied the game at one. New England quickly rattled off two big transition goals. First, Captain Brett Manney (1G) ran the length of the turf and scored jumping over the crease. Under a minute later, David Brock (2G) took a pass from John LaFontaine (2A) and buried the ball in the net. Cameron Holding () brought the Seals’ deficit back to one just over a minute later. The Black Wolves then went on an absolute tear and scored four goals in the final five minutes. Reilly O’Connor (2G, 2A) got the streak started, followed by a goal from Dave Emala (3G, 1A). In the final minute of play Callum Crawford (3G, 6A) and Stephan Leblanc (2G, 4A) both found the net to give the home team a commanding lead. The seven goals in the quarter for New England were all scored by different players, a sign that all cylinders were firing. At the end of the first quarter, New England led San Diego 7-2. The New England run continued to start the second quarter. Resetarits opened the scoring, but this time needed only 14 seconds to break through. Before two minutes had passed, Crawford and Emala both notched their second goals of the game as well and suddenly San Diego was behind 10-2. Connor Kelly (4G, 2A) finally got a shot to go past Doug Jamieson 4:20 in, but Leblanc answered with his second just over a minute later. Veteran Garrett Billings (2G, 3A) scored just over eight minutes in on an assist from Connor Fields (2G, 1A), but on the ensuing faceoff Adam Bomberry (1G) scored with just 10 seconds lapsed. The 12th Black Wolves’ goal chased Scigliano from the cage and Tyler Carlson stepped in. Under two minutes later, Crawford completed his first half hat trick and the Black Wolves led by nine. Casey Jackson (3G, 4A) got one back for San Diego with under five minutes to play, but the offense couldn’t make anything else happen for the remainder of the half. At halftime, the Black Wolves led the Seals 13-5. Things calmed down a bit in the third quarter. After a first half with 18 combined goals, only three were tallied in the third quarter. It took over eight minutes of play before Brock took a clear from Jamieson and scored. 46 seconds later, Emala completed his hat trick with a power play goal. The third goal of the quarter was scored by the Seals’ Fields, his first NLL goal coming in his first game. Fields was drafted 10th overall in the entry draft and has been sidelined with an injury since. At the end of the third quarter, New England led San Diego 15-6. After the slow pace in the third, abundant scoring returned in the fourth quarter. A late third quarter misconduct for a high hit on Emala, left the Black Wolves shorthanded to start the fourth. San Diego rattled off three power play goals in the first five minutes. Jackson scored twice, and Billings scored the third. Just over a minute later, Kelly made it a four-goal unanswered run. In the blink of an eye, the Seals were now only down 15-10 with 9:20 remaining. Kevin Buchanan (1G, 1A) halted the run with a well placed outside shot, but Turner Evans (1G, 2A) responded with 7:01 remaining. O’Connor stretched the lead back to six goals with his second of the game and 5:05 on the game clock. On their next offensive possession, San Diego pulled the goalie in favor of an extra attacker. Kelly was the open man and scored with 3:40 remaining. With 34 seconds remaining, Kelly again was the open man and scored. Fields notched his second goal of the game with 11 seconds remaining and it was too little, too late. 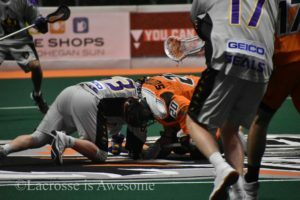 Even though the Seals outscored the Black Wolves 8-2 in the final quarter, they could not overcome the early deficit. Final Score: San Diego-14, New England-17. The New England Black Wolves (8-7) travel to play the Toronto Rock (10-6) on Friday, April 12 at 7:30 PM EST. The San Diego Seals (9-6) host the Saskatchewan Rush (8-6) on Friday, April 12 at 10:30 PM EST.